In the conclusion, you have to rephrase, summarize, and conclude. Here, you cannot simply copy the introduction. Instead, be creative. US education can benefit my child in many ways. My child can master the English language, broaden his horizons, and become more physically strong. Therefore, if I have an opportunity to have my child educated in the US, I will not hesitate to send him abroad. In sentence , I rephrased the main argument. main argument: I Will have my child educated in the US. US education can benefit my child in many ways. In sentence , I summarized the supports. Supports: My child can learn English better. My child can experience various languages and cultures. My child can play sports. My child can master English, broaden his horizons, and become more physically strong. 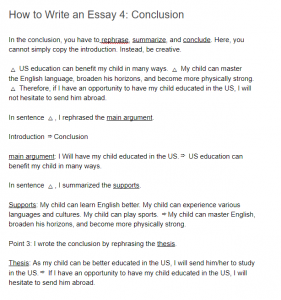 Point 3: I wrote the conclusion by rephrasing the thesis. in the US. If I have an opportunity to have my child educated in the US, I will hesitate to send him abroad.